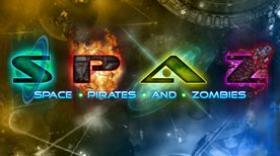 When you’re asked to review a game called ‘Space Pirates and Zombies’ you can’t help but get a little excited. I mean, Space Pirates are awesome enough alone without adding the additional ‘wow factor’ of zombies. Unfortunately not even the addition of ninja sharks with lasers attached riding the bear cavalry into a black hole could have saved this game from a startling mediocrity. Don’t get me wrong I feel bad for saying that. As you boot up the game for the first time you aren’t greeted by a cutscene, rather a short couple of paragraphs telling you about the two developers’ hard struggle to create the game out of their homes for the past two years and thanking you for purchasing the games. Clearly a lot of hard work has gone into this game and the developers have done a good job! Just not necessarily an enjoyable one. The first problem I encountered hit me right at the start of the game. The tutorial is hopeless. Two hours into the game with the tutorial long since past and I still wasn’t quite sure what I was doing half the time. Granted, this may be due to my own stupidity rather than a fault of the developers but they may have well told me “click on random things and mash buttons to see what they do” for all the difference it would have made. The story isn’t much better either. You take control of the pirates who are trying to mine some valuable element at the centre of the galaxy. Valuable resource which everyone is competing over: check. Collapse of government due to expansion of humanity: check. So why on earth (or space for that matter) are civilians and ex-military fighting?? And why are you a pirate?? I didn’t see one Jolly Roger or eyepatch to define me as a swashbuckling adventurer nor did I engage in any particularly pirate-y deeds. In fact if anything I was closer to being a mechanic / miner (I guess Space Labourers and Zombies didn’t sound as catchy). As for the zombies they just kind of appeared a few missions in. No explanation. Nobody particularly concerned when they did appear. Standard. So maybe the setting isn’t too good and maybe the game isn’t particularly clear to you at first. Surely a game as awesome sounding as this has some decent gameplay? Surely?…. Sadly not. You start in our solar system on the fringes of the galaxy with the general intention of getting to the centre. There is always an underlying primary objective that allows you to progress the story but you may also engage in side missions to obtain more resources to build bigger and better ships. The actual missions revolve around using these ships to destroy enemy targets in what becomes a highly repetitive procedure of holding down ‘w’ to move towards the target and holding down the left mouse button to shoot at the target until it blows up. Not really any tactics involved. You can command individual ships to move to desired targets but most of the time you’ll just leave them under AI control to follow you around as you pilot one of them. Yawn. All I can say is they made the tutorial far more confusing than necessary for a game so mind-numbingly straightforward. You will upgrade your small fleet (two hours in and it was an entire 3 ships in size) over time to have better lasers, cannons, turrets, shields, armour, engine etc. etc. but ultimately procedure will remain the same. Judging from the size of the ‘Starmap’ (which shows all the individual solar systems within the galaxy) this game will last a long time. The default is 225 systems I believe each of which contains multiple individual missions. I usually am disappointed at the short length of many indie-games but for once I actually find myself wishing the opposite. If you are a completionist like myself you’ll recognise this game as the bane of my existence. A boring game that takes hours to complete dragging on and on and on. Yet somehow I can’t help but feel the need to whittle away my time on this mortal plane by completing it. Arrggh. Much like cake, the game is a lie. The title promises excitement, adventure and hopefully slicing off zombie heads with a laser cutlass and robotic parrot squawking away on your shoulder. While I can let them away for not fulfilling the latter expectation there I cannot ignore the lack of the first. This game does not appeal to me at all. After only two hours and a fraction of the way into the game I was willing to go stand in my kitchen and watch the freshly painted walls gradually solidify rather than continue further. And for £9.99 – several pounds more than much more enjoyable experiences on steam – I have to say it’s a bit overpriced too. There is a free demo on Steam which you should check out if you get a chance (it is free after all) but I’ll just warn you to not get your hopes up like I did. New theory: the more clichéd the title the worse the game. Discuss.